Leaving college for the "real world" can be a jarring experience for any new graduate. And if a new survey is any indication, a particularly unpleasant surprise awaits the bright-eyed, fresh-faced class of 2015 when they get those first paychecks. What new graduates expect to earn in their first job is pretty different from what grads of 2014 and 2013 have actually been making, according to a survey released Tuesday by the consulting firm Accenture. The survey found that while just 15 percent of the class of 2015 expects to make $25,000 or less after graduation, a stunning 41 percent of the classes of 2014 and 2013 is earning in that range. Nearly half of the class of 2015 said they expect to make $40,000 or more annually in their first job, according to the survey. Only a quarter of the classes of 2014 and 2013 earns that much. "They believe they've better prepared themselves and that they should command a higher salary," said Katherine LaVelle, a managing director at Accenture Strategy who worked on the study. LaVelle notes that 21 percent of the classes of 2013/14 work part-time either by choice or because those are the jobs they could find. "So I would expect that the average salary for those working full-time is likely higher. It's too early to tell where this class might fall in terms of salary." 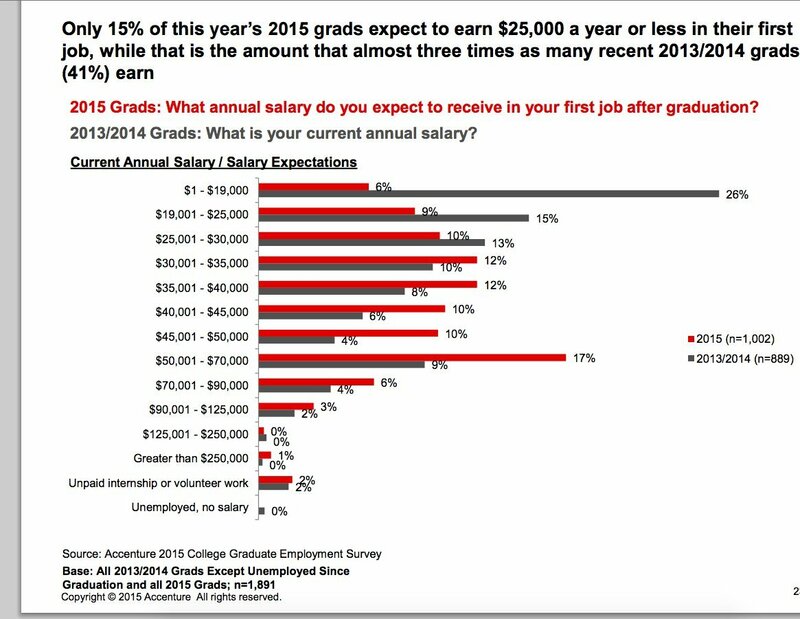 Accenture polled 1,002 U.S. students graduating college in 2015 and 1,001 graduates from 2013 and 2014. The survey was conducted online in March; and this is the third year Accenture has done it. The good news is that class of 2015 is better prepared for the job market compared to its predecessors, said LaVelle. Accenture's study found that 72 percent of the class of 2015 held internships while in school, up from 65 percent of the graduating class the year before. Eighty-two percent of this year's graduates said they considered the availability of jobs before deciding on a major, up from 75 percent of the class of 2014 and 69 percent of the class of 2013. And there was a slight uptick in graduates who majored in science, tech, engineering and math -- the so-called STEM fields -- degrees that are known to earn graduates a premium on pay. Twenty-eight percent of the class of 2015 majored in STEM, up from 26 percent for the classes of 2013/2014. These are young adults who grew up amid the financial crisis and entered college as the recovery kicked into gear. "It makes perfect sense that they did their homework," said LaVelle. Job prospects for college graduates have been pretty terrible for a long time, said Josh Bivens, research and policy director at the left-leaning Economic Policy Institute. The average young college graduate, between the ages of 21 and 24, makes just under $18/hour, or $36,000 a year, according to new data that EPI is set to release later this month. As an average, that figure is probably skewed a little high, said Bivens. Since 2000, grads have actually seen their pay fall from $18.41 an hour to $17.94, according to the new EPI data. A lot of college graduates wind up "underemployed" in jobs that don't require a degree, said Bivens. The unemployment rate for young college graduates was 8.5 percent, according to a 2014 report from EPI, but the underemployment rate was nearly double that. "There's a reason there's a stereotype of college grads working as baristas in coffee shops," he said. Indeed, 49 percent of graduates from 2013 and 2014 consider themselves "underemployed," according to Accenture's latest study. Meanwhile, the class of 2015 has the highest-ever levels of student loan debt, according to data published in the Wall Street Journal last week. The average amount a 2015 grad will have to pay back is $35,000. More than 70 percent of this crop of grads took out loans to pay for school.